Back in my paramedic days, I was called to the RFDS to transport an injured Chef who had managed to put a very nasty cut on his arm with the kitchen knife. This happened on a remote mining camp and the Chef was flown to Perth under medical care. When I received the patient, I was surprised to see the amount of dressings that had been applied, I am talking about a stack so high it was off-balance, an easy 10cm blood soaked thick wad of dressings. Why, because that is what everyone is taught in a typical First Aid course – Never Remove a Dressing from a Bleeding Wound; When It Bleeds Through Just Add on More Dressings! 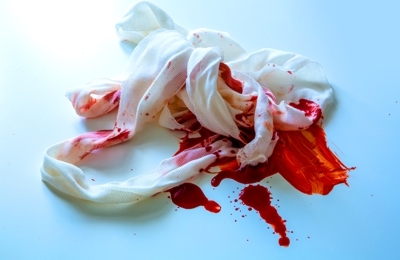 The myth explained: Every major first aid resource says to apply a dressing on any uncontrolled hemorrhage, and if it soaks with blood to add more dressings on top of the original but not remove the blood-soaked dressing. The claim is removal of the original dressing may disrupt clots that are forming, causing the patient to continue to bleed. To start addressing this myth it’s important to understand the basics of hemostasis, the process through which clots form. When an injury to a blood vessel occurs, collagen and von Willebrand factors (vWF) are exposed and promote platelets to attach to the wounded surface. As platelet aggregation occurs, a plug develops which stops the bleeding. Platelet aggregation occurs along human tissue. Once a platelet plug occurs and hemorrhage stops, a fibrin mesh begins to form that stabilises the clot and strengthens it. When a dressing is applied to a wound, the goal is to stop the bleeding. This is successfully completed 95% of the time with well-aimed direct pressure directly into the injured tissue. The key to well-aimed direct pressure is to apply adequate pressure into the injured tissue and on the injured vessel. When pressure is applied generally around the wound there is typically inadequate pressure to stop the hemorrhage. Well-aimed direct pressure means targeting the pressure directly into the hemorrhaging tissue. There is not one clinical trial that demonstrates removing a blood-soaked dressing will cause clot removal or cause the clotting process to start over. When large bulky dressings are applied over hemorrhage sites it becomes very difficult to apply well-aimed direct pressure into the wound and as a result more generalised pressure around the injury occurs. At this point, the dressing becomes a source for collecting the lost blood and is actually doing very little to control hemorrhage. Dressings that quickly become saturated with blood are an indication adequate pressure has not been applied to the bleeding site. Simply adding more dressings on top of the injury will do little more than absorb more blood; it will not help control bleeding or support clot formation. When a dressing becomes soaked with blood, remove it and apply better aimed pressure with a clean dressing. In 2014, the American College of Surgeons released a position paper on prehospital hemorrhage management strategies. In this paper they identify that well-aimed direct pressure is likely to control hemorrhage in most instances. When hemorrhage cannot be controlled with well-aimed direct pressure, they recommend the next step be tourniquet placement for extremity injuries. In instances when a tourniquet cannot be applied they recommend a hemostatic agent be added to a pressure dressing. Hemostatic dressings must be applied directly to the source of the bleeding in order to work. 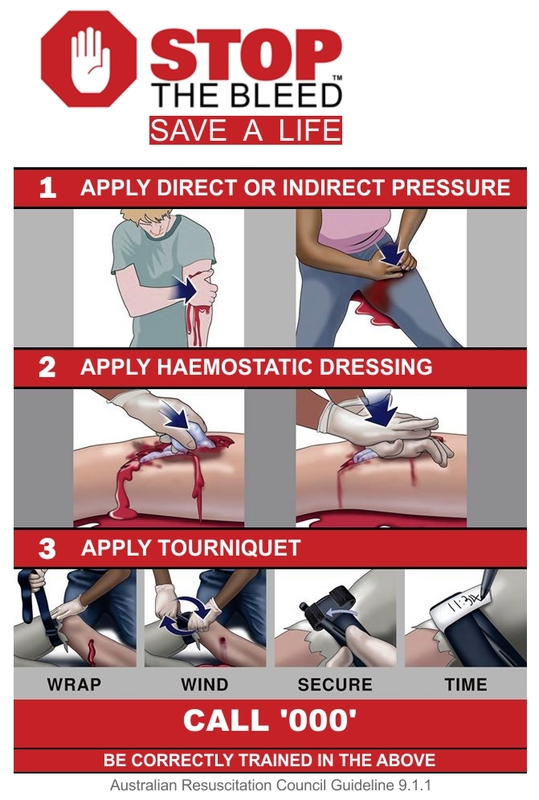 If initial direct pressure fails to control hemorrhage, remove the dressing and apply well-aimed direct pressure onto the hemorrhage location. When this fails, a tourniquet or hemostatic agent should be used. Be trained in its use. The importance of training on the use of haemostatic dressings and tourniquet application for the civilian setting is critical. But that my friends, will be a different post. *** Part of this article has been reproduced with approval from EMS World (thank you). – Bulger E, et al. An Evidence-based Prehospital Guideline for External Hemorrhage Control: American College of Surgeons Committee on Trauma. Prehospital Emergency Care, 2014; 18: 163–173. This entry was posted in Stop the Bleed and tagged Haemostatic Dressings, Stop the Bleed, Tourniquet.